Habit: A shrub or small tree that grows up to 25 feet tall and up to 15 feet wide and develops a wide rounded shape. Foliage: Leaves are alternate, pinnately compound, 5 to 9 inches long with 9 to 17 leaflets that attach directly to the stem. The individual leaflets are narrow, elliptic to lance-shaped, sharply toothed, 1 ½ to 2 ½ inches long. Their color is lustrous dark green above, lighter beneath. Leaves persist late into the fall. Flowers: Very showyblossoms in May on slender-stalks that are ¾ to 1 inches in diameter. 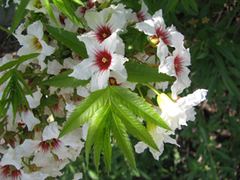 The flowers are white with 5 petals and have a yellow to red blotch at the base of each petal. Fruit: The fruit is a 3-valved, thick-walled, 2 to 3 inch diameter rounded capsule. Each cell contains several dark brown seeds that resemble chestnuts. They can be roasted to eat but are bitter when raw. 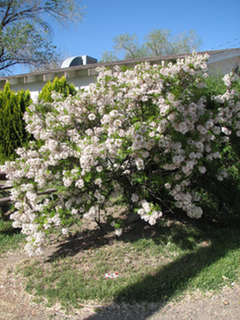 Insects and diseases: Because this tree is so unusual in Colorado pests are not an issue. 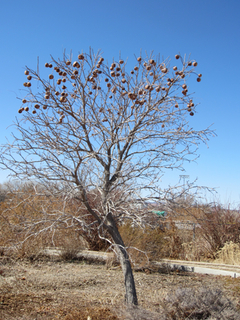 This Tree in Colorado: There are specimens growing on the western slope in dry and alkaline sites. The Grand Junction Arboretum at Lincoln Park and the CSU Extension garden at the Mesa County Fairgrounds have planted Yellowhorns for display. 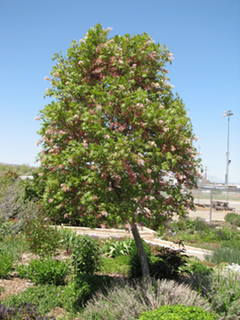 Once the tree is established it can put on up to 10 inches of annual growth. Cultivation: Prefers long, hot growing seasons in order to flower well. In cooler areas provide a protected location to encourage flowering. The yellowhorn grows well in well-drained moderately fertile to fertile soil. Interesting facts: This is the only species in the genus Xanthoceras.